James Key was eager to attest to the widesweeping changes that can be seen on the STR10 here in Barcelona as he admitted the initial car was just a banker to get mileage under both the new drivers belts. As part of this almost B spec car the STR10 is sporting a new nose, as their original longer nose was easier to get through the crash tests. 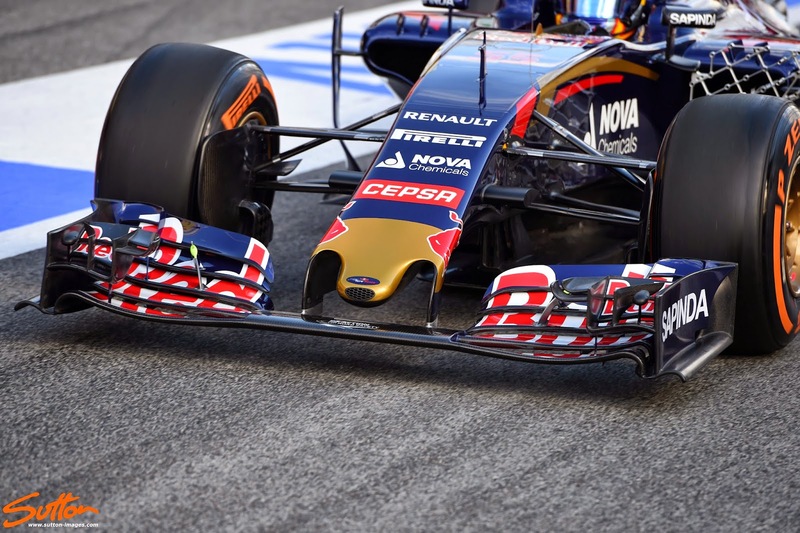 The shorter 'thumb' style nose is similar in design to Red Bull and Williams and should allow more airflow to travel under the nose. 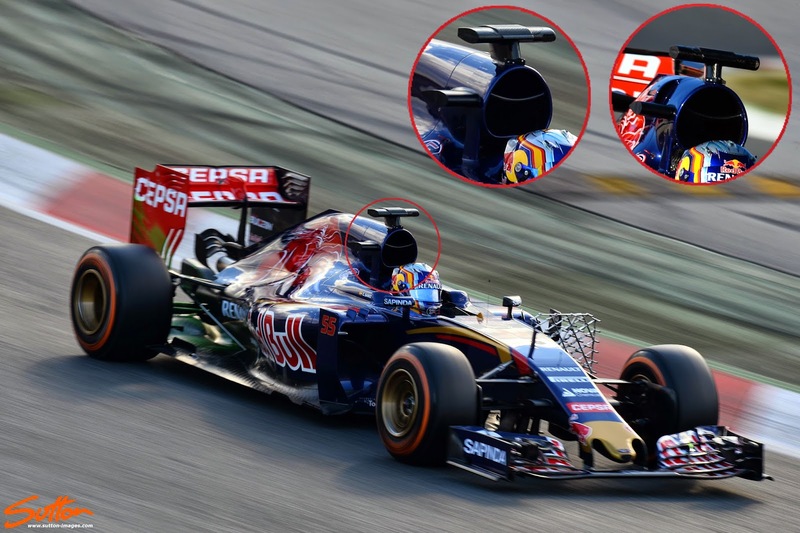 The team had originally used camera stalks, in a similar vein to those used by Mercedes, Ferrari and latterly Red Bull last season. 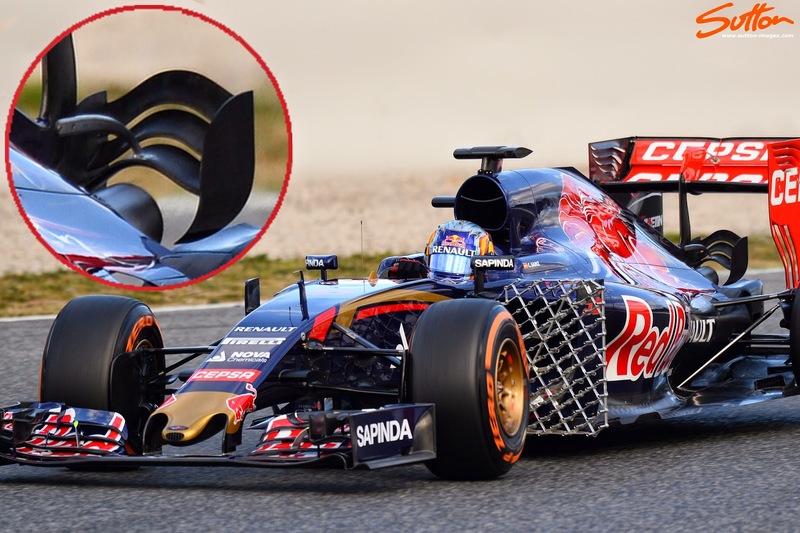 With all the teams having received a technical directive from Charlie Whiting in regard to their legality, Toro Rosso have abandoned them in their latest design, opting for a simple side mounting. The change in nose has also prompted a rethink on the chassis, as pectoral fins have sprouted on the upper surfaces periphery. These will help guide the airflow, spilling vortices that will assist in the sidepods performance. 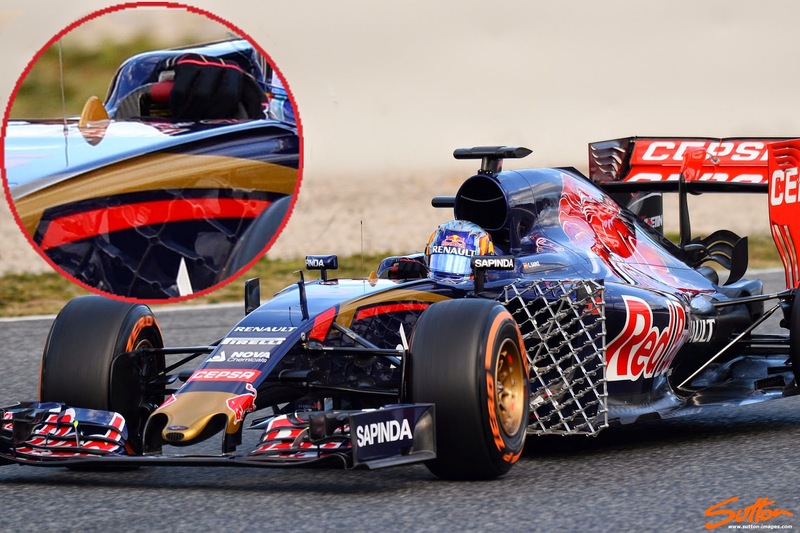 The STR10's front wing (right, below) is now a 5 flap, 6 outer tier configuration and more than ever resembles the sort of layout you'd see on the Red Bull car. Changes have also been made to the cascades, with a smaller arrangement now hung from the main cascade. 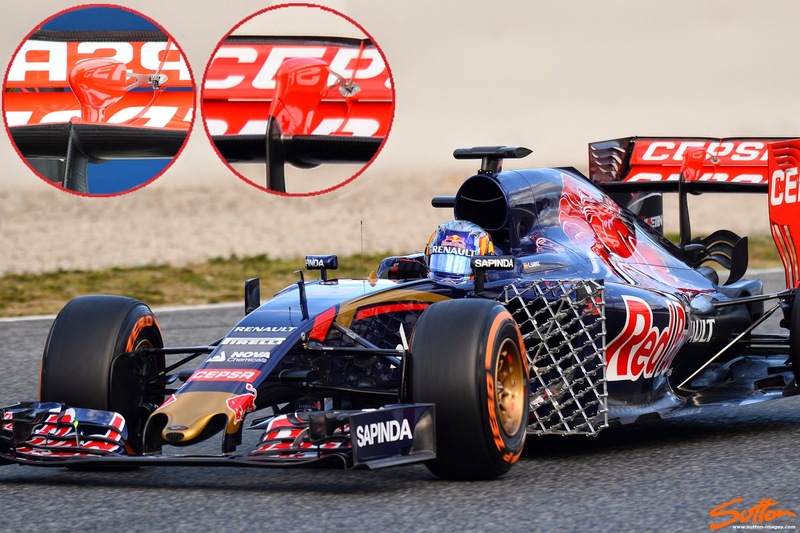 Toro Rosso had been deliberately cautious with the STR10's cooling as they always tend to be, at this final pre-season test the team have deleted the oil cooler snorkels though (upper left inset, below), with the job likely taken care of by the the main airbox. A new vertical strake has been added to the STR10 in the tyre deck region (below), helping to control how tyre squirt impinges on the diffusers performance. The shorter triangular strake that's been added is also curved in toward the sidepod, rolling the airflow it receives. 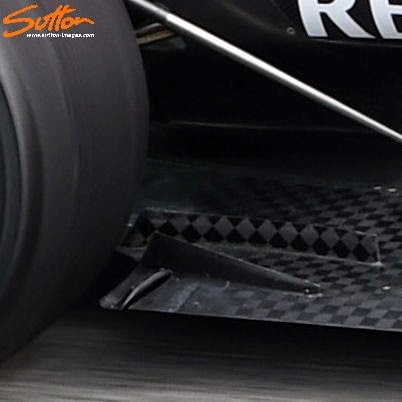 The team have also changed their rear wing support pylon, previously the pylon attached to the lower forward edge of the mainplane (left inset, below), whilst the new support is a swan-neck style pylon, connecting to the DRS actuator above the mainplane. This will help reduce separation on the underside of the mainplane, especially in yaw as it affords the mainplane more freestream airflow. The team have changed their Y100 winglet (monkey seat), which now bears some resemblance to the one the team used initially in 2014. I'm rather sad to see their previous (leaf) iteration go as it looked so elegant but this one obviously has been designed to interact with the other structures more efficiently. It has three main elements, joined to curved endplates. These curved elements are reminiscent of the ones used by Mercedes on the W05's winglet and look to manipulate the exhaust plume. The team have made widesweeping changes to the STR10's rear wing endplates, the new ones (right,below) feature twin leading edge tyre wake slots, an array of strakes which promote the upwash of the airflow, whilst the louvres have been reshaped too.